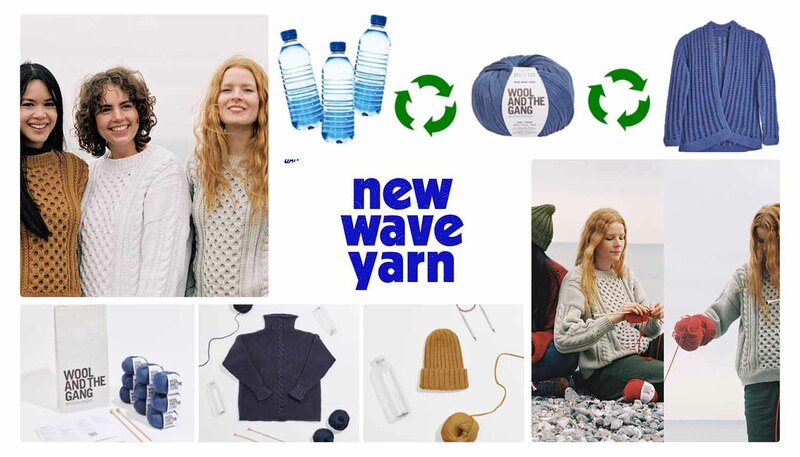 Wool and the Gang – the sustainable DIY fashion pioneer – is launching a new way to turn recycled plastic bottles into fashion. Cult favorite knit brand Wool and the Gang is introducing balls of yarn made from recycled plastic bottles, an industry first, as their latest eco-friendly innovation. Available next week, each ball of yarn contains the equivalent of three plastic bottles. Along with this yarn, Wool and the Gang will be launching a collection of nine new knit kits: DIY kits with all of the materials that you need to knit your own sweater, beanie, scarf, market tote, and more. Perfect for everyone, including beginner knitters to expert stitchers. Launching January 22nd on woolandthegang.com. Retail prices range from free (two free patterns! ), to $52 for a beanie, to $56 for a tote, to $148 for a sweater. All kits are available with the “New Wave” yarn in the color of your choice and all of the materials you need to knit or crochet your project. According to its “2019 Retail and Sustainability Survey,” Computer Generated Solutions, a business applications provider, received feedback from more than 1,000 consumers across the United States. Sixty-eight percent of those consumers surveyed felt sustainability influences their spending to some degree. Remember this is fast fashion done right – slow and sustainable. It’s from plastic to fashion.